A revolutionary “virtual tape measure” – known as Body Shape Recognition For Online Fashion – promises to make badly fitting clothes (and even badly lit fitting rooms) a thing of the past, advising the user on which size dress, trouser or top they should buy in every retailer. 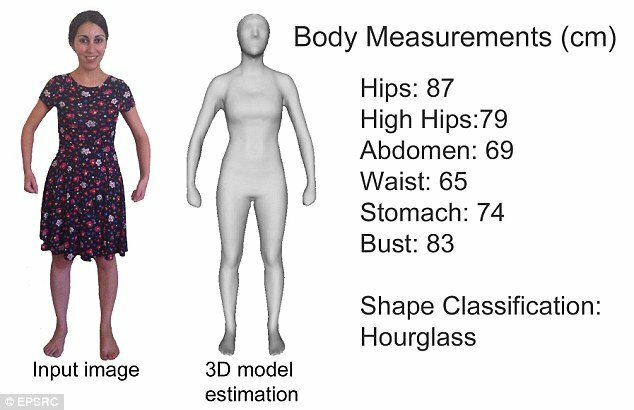 The web-based body-scanner would take detailed measurements of the body via webcam or smartphone, create a 3D image of the user, then advise on which size garment to buy whenever they visit the website of a participating retailer. Taking multiple measurements of the body, the system aims to ensure the best possible fit, saving shoppers and retailers millions of pounds a year in return postage costs, as well as eliminating the need to send back clothes that are the wrong size or fit. Currently, between 30 and 60% of all clothes bought online are returned to the shop. Body scanning is already starting to make a mark in the clothing retail sector, but these often involve the user stepping into a machine that “photocopies” the body. The new software – being developed by London College of Fashion and computer vision experts at the University of Surrey – requires only a photo of the user in their underwear, their height, and an internet connection. Philip Delamore from London College of Fashion said: “The potential benefits for the fashion industry and for shoppers are huge. The 18-month project Body Shape Recognition for Online Fashion is being developed in collaboration with body-mapping specialists Bodymetrics and digital creative agency Guided. The research builds on previous work by the University of Surrey in developing 3D body-shape templates from single-view images, which has been used commercially in creating animated representations of people for games such as The Sims. Plans to launch the new system are anticipated within two years.